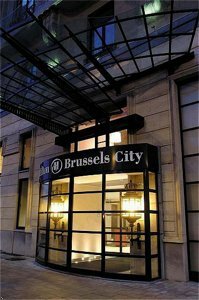 The Hilton Brussels City hotel is in the heart of the city by the smart Rue Neuve shopping district. The bustling cafes of the Grand Place are just 10 minutes' walk away. Enjoy fresh seafood or sizzling steaks at the L'Oliva restaurant or try a cold Belgian beer in the bar. Business is easy at the hotel. It's just 5 minutes' walk from the World Trade Centre and 30 minutes' drive from the airport. The hotel boasts 3 sunlit meeting rooms for 2-70 and wireless internet access throughout. From Hilton Guest Rooms to Deluxe Rooms, all rooms have wireless internet access. Step up to a Deluxe Room for a city view. Keep fit in the well-equipped gym or relax in the sauna and steam room at the hotel's Scandinavian Wellness and Health Club. There's a lot to see nearby - Brussels attractions like the historic Royal Palace are within walking distance. Hilton Guest Room - Enjoy your stay in this comfortable room with wireless internet access. The contemporary room is decorated in vibrant and fresh colours. Catch up on work at the desk or pamper yourself in the marble bathroom. Some bathrooms have a separate shower. Deluxe Room - Wrap up in a fluffy bathrobe in this modern, comfortable room with wireless internet access. Get to work at the desk or refresh in the marble bathroom. Some rooms have a separate seating area with sofa; some have city views. Some bathrooms have a separate shower. Junior Suite: Spoil yourself in this contemporary suite offering a separate working area. Catch up on work at the desk with wireless internet access, or simply refresh in the marble bathroom with separate bathtub and shower. Enjoy complimentary Spa access. Suite: Indulge in this spacious and contemporary suite with wood laminate flooring. Surf the web with wireless internet access in the separate working area watch a movie on the plasma TV or refresh in the marble bathroom offering a separate bathtub and shower. Choose to unwind with complimentary access to the Spa. From Brussels Airport, taxis are available to take you directly to the Hilton Brussels City hotel. The journey normally takes around 30 minutes from the airport to the hotel forecourt. Directions: Taxis are available to take you directly to the Hilton Brussels City hotel. The journey normally takes around 30 minutes from the airport to the hotel forecourt. Enjoy modern French cuisine in an intimate setting at this Brussels restaurant. Sample foie gras, fresh seafood and prime filet steaks in the Hilton Brussels City hotel's smart dining room styled with dark wood and red leather chairs. Unwind with a glass of wine or a Belgian beer. A modern, fully equipped meeting room with natural daylight - an ideal place for dynamic, successful meetings. Individual air conditioning, dimmer lights, direct telephone, modem and wireless internet. A modern, fully equipped meeting room with natural daylight - the ideal place for dynamic, successful meetings or get-togethers. Individual air conditioning, dimmer lights, direct telephone, modem and wireless internet. Elisabeth also has a separate entrance.